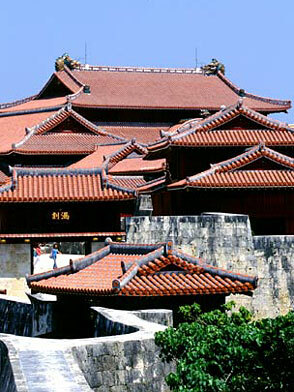 Shuri castle (Shurijo) is the most outstanding of the nine Gusuku sites . It is located in the eastern part of the city of Naha, Okinawa Prefecture and was the center of the Kingdom of Ryukyu in 1492, (the year Columbus traveled to America) when Lord Shohashi unified the island kingdom. Gusuku sites are the ruins of the castles and their walls today tell of an intriguing Ryukyu culture that once reigned unchallenged . They was built between the late 14th and 18th centuries when the Kingdom of Ryukyu was at the height of its existence.